Many apps available on the Android Market include an End User License Agreement, or EULA. This is a simple dialog that appears when you first launch the app, and presents a licence agreement governing your use of the app. Most often, this dialog explains what information the app will collect from your phone, and how that information may be used by the developer. Some third-party libraries such as Google Analytics require you to disclose your data collection policy to users. 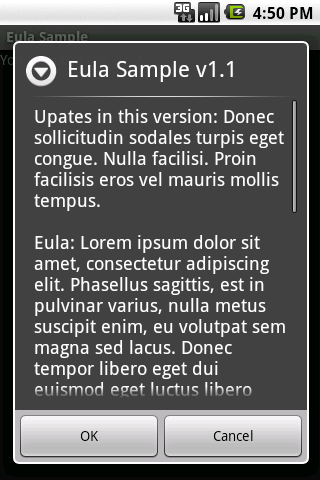 The most common way to do this is to present an EULA dialog when the app is first launched. 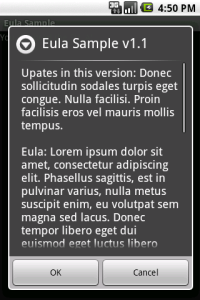 So how do you make an EULA dialog? 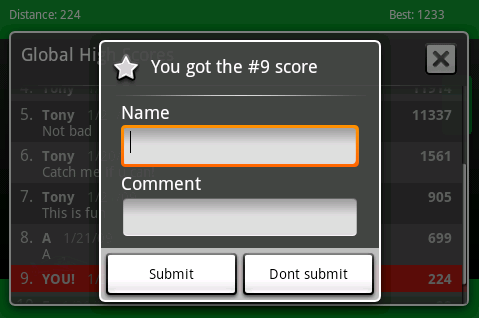 Here are a couple of tutorials to help you add a license agreement to your Android app. My latest application, Tap That! 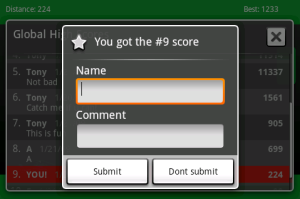 Number uses the ScoreNinja library to integrate global high scores. This library is very easy to include with only a few lines of code. Other solutions such as ScoreLoop try to bundle a full social framework, but ScoreNinja does just one thing – global high scores. In this post I’ll teach you how to integrate ScoreNinja into your own Android app.